I have made it my personal and professional goal to work with the citizen's of Cheboygan, and to strive to achieve excellence in our Cheboygan County Sheriff Department. 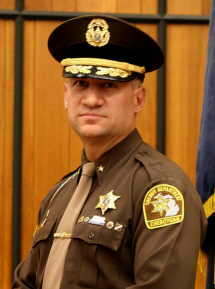 The Cheboygan County Sheriff Department is proactive in its dedication to serving the public. With community support and by working together we are able to better protect our community and you, the citizens that live here. It has been and continues to be my greatest personal achievement and honor to serve the citizens of Cheboygan County as your Sheriff. It is the Mission of the Cheboygan County Sheriff's Department to assist the people of Cheboygan County in our mutual desire for a safe and secure community through our dedication in providing Correctional, Law Enforcement and Related Services at the highest possible standards, while respecting the rights of all people. Cheboygan County-Sheriff Clarmont warns of a contractor scam entering the area via the internet. “Another scam with a twist but all meaning the same and wanting your information and money” said Clarmont. This latest scam involves contractors getting an email seeking a bid for work such as electrical or plumbing or small remodel then sending a cashier’s check above the amount quoted with instructions to send the extra funds back. “A contractor may quote $4,000.00 and get a check for $6,000.00 with instructions to send the remaining funds elsewhere” said Clarmont. The Sheriff wants to remind citizens in all instances regarding unsolicited contact that when a check is in the mail with instructions to send funds back, it is a scam. The Sheriff also advises citizens to read their unsolicited mail or email carefully as most will write with broken English, misspelled words and poor sentence structure. “The best reply is not to respond or to advise you cannot help them” said Clarmont.